At the Source features a county Department of Water Supply employee who zips around protecting Maui’s source water in true superhero fashion. The film won the county’s 2018 Source Water Protection video contest. Millions of people around the world are exposed to lead contamination of water and its harmful effects. Exposure to lead, especially in children, have lasting effects to development of brain, nervous system, and organs. It is estimated that over 5000 water systems, in US alone, have lead contamination issues. 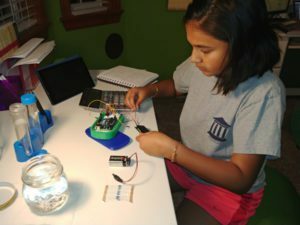 The problem is compounded by the fact that accurate and actionable detection of lead in water today is an expensive and time consuming process. Eddy Covariance is how an ecosystem’s “breathing” is measured, as explained in this video. It’s the CO2 and other gases that are exchanged between soil, vegetation, and the air in an ecosystem. The data it provides helps scientists to develop models that forecast long-term trends in CO2 and greenhouse gases. Climate change is coming, and it’s coming fast. To conquer the bare slopes this winter, buy grass skis! It’s simple. Just tape them to your feet, butter them up, and your ready to go. This new alternative to skiing on snow is cheap, easy to use, and a great way to adapt to to a changing climate. Running from the Rocky Mountains to the Sea of Cortez, serving 40 million people, the Colorado River is running dry. Cows farts could change the world. Low flows on the river are affecting the ecological community which includes people. Zack’s online request for a roommate is answered by Molly, a tech-savvy dumbo octopus on a mission to tell the world about the importance of the deep ocean. This short film full of ocean imagery references the coral polyp’s central role in the Kumulipo, or Hawaiian creation chant, as a metaphor for its current role as warning sign of the destruction modern humans are doing to our oceans. The film features voiceovers by local ocean advocates Ekolu Lindsey, Lily Solano and Paige Alms about rediscovering our kuleana to protect our ocean. 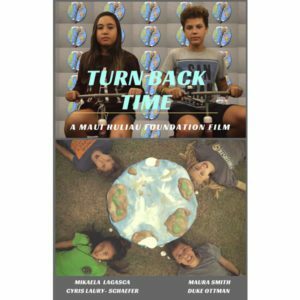 Inspired by the 21 Pilots song Stressed Out, this mixed media musical parody employs various stop motion and animation styles to represent the environmental impacts of modern society set to an original song written by Maui middle school students. This National Geographic style “mockumentary” examines the modern life and behaviors of “couchus dominus” and the consequences its lifestyle has for the Earth and its fellow species. An Australian composer, on a six week visit to Minnesota, collaborates with musicians, scientists, beekeepers and animators to create an original multi-media string quartet composition based on audio recordings of honeybees. Our Last Trash highlights the current global recycling crisis and the adverse effects of disposable plastics on the environment. The film explores the meaning of a “zero waste” lifestyle, and how some individuals are combating this plastic issue one reusable item at a time. Colorful animations and riveting interviews reveal how we can create a more sustainable planet. The film stares down the automobile. In climate change, humanity faces a global crisis that is in scale and complexity unlike anything we have encountered before, yet we already have the solutions.